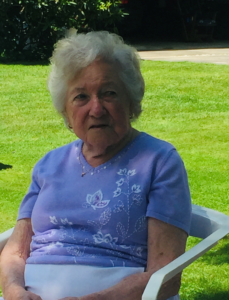 LEWISTON – Yvette (Letourneau) Dubuc, 92, of Lewiston, passed away peacefully on Saturday, Feb. 9, 2019, at home, with her loving family by her side. Yvette was borin in Burke, Vt., on July 13, 1926, the daughter of the late Eugene and Emeremtienne (Roy) Letourneau. She attended local schools graduating from Lewiston High School. She was a beloved wife and homemaker for many years and was also a well-known waitress at the finer restaurants in the area. She was a loving woman who was immensely proud of her family and her home. As a wife, mother, sister, daughter, grandmother and great-grandmother and friend, the world was a better place with her in it. In addition to her family and beloved relatives, she enjoyed cooking and she was considered an exceptional cook. She had a great love and wisdom in the use of words. “This too will pass” was an expression she used to help calm a tense situation. She taught her children and grandchildren to not let pride get in the way to resolving problems that may arise. This was the legacy she left her family. Yvette is survived by her sons: Ronald Dubuc and wife, Susan, Michael Dubuc and fiancée, Deborah Tempesta; grandchildren: Aimee Brown, Michael Ryan Dubuc, Jenna Footer and husband, Nate Dubuc; great-grandchildren: Baylee and Sophia Brown, Noah and Autumn Footer and Jonathon. Besides her parents, Yvette was predeceased by her husband, Roland Dubuc; a granddaughter, Angela Dubuc; a great-granddaughter, Abbey Footer and many brothers and sisters. The family would like to thank Sonia and Jaimie of Beacon Hospice, and Jen of Elite Home Care, for the love and passionate care they gave Yvette during her final illness. You are invited to offer your condolences and share fond memories with the family by visiting Yvette’s guestbook at www.thefortingrouplewiston.com. Visiting hours will be held at The Fortin Group Funeral Home in Lewiston on Tuesday from 9-11 a.m. Funeral services will be held at the funeral home on Tuesday at 11 a.m., followed by committal services at St. Peter’s Cemetery in Lewiston. A service of The Fortin Group Funeral Home, Cremation and Monument Services, 70 Horton St., Lewiston, Maine.